Heavily-favored Terra Promessa took the lead at the start and was never threatened as she cruised to a 7 1/2-length victory in the G3 Allaire DuPont Distaff at Pimlico May 19. Terra Promessa broke alertly under jockey Jose Ortiz and went right to the front. She was tracked closely by Carrumba in second an Mo' Green in third as the field swept through the clubhouse turn and entered the backstretch. The order remained unchanged on the backstretch, but Carrumba began to edge closer as the field entered the far turn. It appeared briefly that Carrumba would soon draw even with Terra Promessa to challenge for the lead, but Terra Promessa quickly put that thought to rest as she suddenly spurted away and began to widen her lead. Terra Promessa continued to draw off through the stretch, crossing the wire 7 1/2-lengths in front. Carrumba had to settle for second, 2 1/4 lengths in front of Mo' Green. Final time for the nine furlongs was 1:49.12 over a fast main track. Bred in Kentucky, Terra Promessa is out of the multiple stakes winner Missile Bay (Yes It's True). She is trained by Steve Asmussen for Stonestreet Stable. 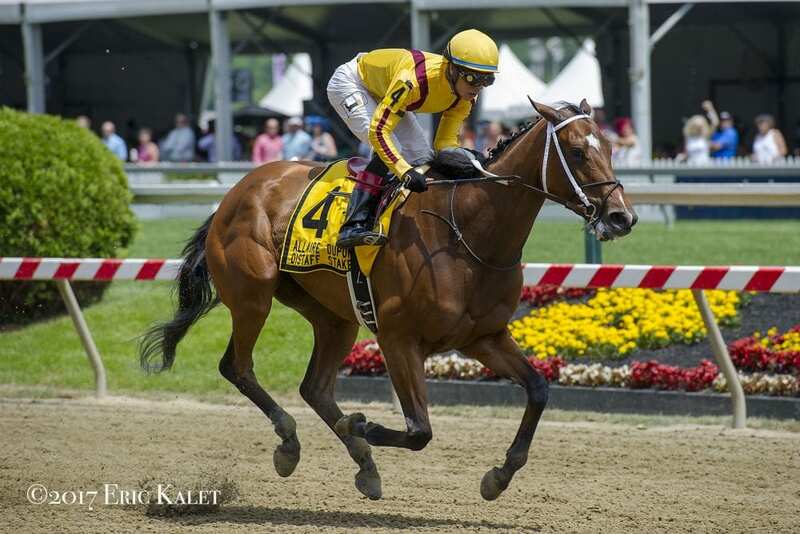 This entry was posted in Racing and tagged allaire dupont distaff, carrumba, Curlin, Horse Racing, mo' green, pimlico, steve asmussen, Stonestreet Stable, terra promessa, thoroughbred by Paulick Report Staff. Bookmark the permalink.